My name is Audrey Rodriguez. I am Jim Hyde’s Assistant and the Administrator at RawHyde Adventures. I have been with RawHyde since December 2013. I was born in Simi Valley, California, and now live in Castaic. I have ridden dirt bikes as a kid and teenager, and owned my own 125 quad. I never knew the adventure motorcycle world existed until coming to RawHyde. Since then, I have enjoyed communicating and meeting with customers and look forward to working with you RawHyde Adventures. My other interests include....well, anything to do with the outdoors - camping, boating, shooting (sporting clays), and 4x4ing. Nothing compares to doing those things with my husband and two daughters. I hope to meet you out on the ranch someday. Call me to register for a class, rally, or tour! Hi, my name is Bill Langford. I was born in California, although I spent my early years growing up in Richardson Texas, a small town just outside of Dallas. Growing up in the country as a young boy, I was infatuated with any two-wheeled motorized bike. I could ride for days in the Texas hills chasing armadillos, jackrabbits and cows. After high school I joined the Navy and spent 5 years on Nuclear Submarines and Special Ops. Returning from the service I moved back to California and graduated from Cal State University, Long Beach. I own a design and manufacturing business in the sports industry called TRI ALL 3 SPORTS. We manufacture hard-shell cases for the transportation of racing bikes and racing wheels. We also make cases for Homeland Security and Special Ops. I am an avid cyclist and IRONMAN Triathlete. My wife Barbara is also an IRONMAN Triathlete and motorcycle enthusiast. We enjoy camping in our Sportsmobile, Photography, and target shooting. I love motorcycles and have a number of BMW's and Ducati's. Riding a BMW or a Ducati on a racetrack will certainly get your adrenaline going. However my real passion is for Adventure Riding, exploring the backcountry on dirt trails, enjoying the beauty of our country that you don't see from a concrete highway. I have ridden all over the western part of the United States and Baja, including the Continental Divide from Mexico to Canada with Jim Hyde. I met Jim Hyde in 2006 and joined his team in 2007. Our goal as Coaches at RawHyde is help you to develop the skills and confidence necessary to take you out of your normal comfort zone. To challenge you to take the journey that separates those who are only bystanders in life; to those who truly participate and explore the riches of life. My name is Chris Zurn and at RawHyde, you'll catch me coaching the 'Intro to Adventure' course and helping support our epic tours. A little about me... I had been riding pavement since 1989. During all that time, my inner voice had me looking down endless stretches of dirt. In more recent years, that inner voice ceased whispering and began shouting: "Get into adventure biking!" I heeded the call, purchased a 1200 GSA in late 2010, and 3 months later, found myself in the Intro course I now teach! I had been bitten by the adventure bug, and I've been infectiously promoting this sport since 2011. I've ventured beyond the familiarity of home and explored Mexico, the Continental Divide and most recently, Alaska and Canada. I predict and hope the lens in which you view the world will forever change as it did for me. My mission is to share enthusiasm, skills and helpful information with new riders whenever possible. I can't wait to help you steer your own ship, and it sets sail at RawHyde. Four wheels move the body, but two wheels move the soul. Carpe adventum, friends! Hello, my name is Tom Biery and I am a coach for RawHyde Adventures. I was born in the midwest but have lived most of my life in Colorado where I still reside with my family. I started my time with RawHyde in late 2016 and it’s been a blast. When I’m not riding with RawHyde, I serve as a Firefighter/Paramedic for a large Denver metro fire department. Like many, I owned my first motorcycle at a much younger age – 350cc dirt bike for me. Since then, I have owned several bikes both for street and dirt but, it was not until recently that I discovered adventure motorcycles and landed on a BMW GS. Now that I know what the large adventure bikes are capable of and the places they can take you, I don’t plan on ever getting off of my GS. Thankfully, my beautiful wife loves riding two-up and supports my motorcycle habit. 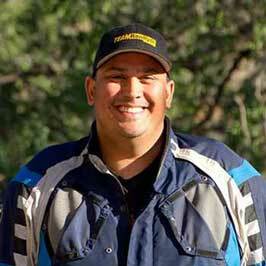 Jeff Camacho has been an Instructor with RawHyde since 2011. Being a California native, it's afforded him the gift of being smack dab in the middle the "SoCal Motorcycle Culture". 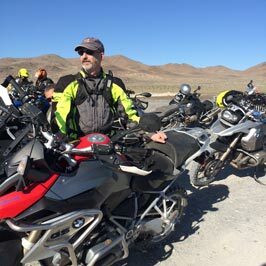 Jeff has owned all types of motorcycles from dirt bikes to Harley Davidson Motorcycles to performance bikes until finally finding and falling in love with his BMW R1200GS Adventure. He has been riding since the tender age of 6 years old. He spent his childhood riding the California Deserts and Mountains. 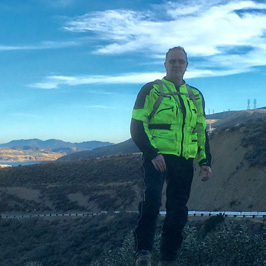 For several years, Jeff was active in racing the AMA District 37 Grand Prix Circuit and has raced the famed Lake Elsinore Grand Prix many times. Although Jeff proudly coaches newer riders at RawHyde, He affectionately remembers the joys and pains of the learning process. 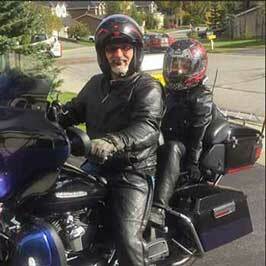 Helping others reach their goals truly gives him another form of fulfillment from motorcycling. Jeff has been lucky enough to participate in several of RawHyde’s big tours. 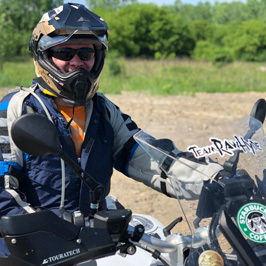 Two of his favorite tours are RawHyde’s Continental Divide Ride (CDR) and more recently, RawHyde’s Big Bikes in Baja Tour. They are both vastly different in many ways but they each allow you to see parts of North America that many don’t have an opportunity to see. To say motorcycles are his passion would be an understatement. If he’s not spending quality time with his kids, Emma and Cash, or working in Pasadena as the Sr. Vice President of an engineering services company, it’s safe to say he’s probably out riding! Hello and welcome to the incredible world of Adventure Riding! I’m Jon K. and I’m happy to say you have come to the right place to develop your skills and confidence as an Adventure Rider. I started riding street bikes as a teenager and made many mistakes as I learned how to handle a motorcycle on the congested roads and freeways of Southern California. It wasn’t until many years later that I took my first motorcycle safety course and realized just how much I had yet to learn. The importance and value of quality motorcycle training cannot be overstated. I grew up with an appreciation for nature and a love of exploration. With that in mind, I made the transition to dual-sport motorcycles in 2005 and discovered a whole new world of possibility on two wheels. I attended the “Intro to Adventure” training at RawHyde Adventures in 2011, and joined the staff as a coach and guide later that year. Since that time, I have had the pleasure of coaching and guiding tours while working alongside some of the best (and most entertaining) adventure riders to be found anywhere. I’m proud to be part of the RawHyde team and I look forward to seeing you on the trail! My name is Kerry Schilf and I was born in Chicago Illinois. I currently reside in Southern California and have a background in law enforcement. Growing up, I had a strong sense of adventure and I loved outdoor activities. It didn’t take long before I met friends with a passion for motorcycles. I didn’t get the opportunity to own a motorcycle as a youngster, but I purchased my first street bike at the age of 20 and never looked back! I have had the opportunity to work many different assignments during my law enforcement career, but nothing has been more rewarding than being a member of the Traffic/Motorcycle squad. I joined the motorcycle squad in 1999 and became the Motorcycle Training Officer in 2006. Teaching precision riding techniques has been my passion and I enjoy seeing people improve their skill level. My other interests included horsemanship, camping, fishing, and snow skiing. Most importantly, I get to share all of my life experiences with an amazing wife (who I met in 1992)! I look forward to riding with you and sharing the RawHyde Adventures! Hi there! I’m Lauren Kennedy. I was born in Louisiana, and grew up a swamp rat, roaming around on a farm with my sister, 5 dogs, 10 cats, 30 cows, countless turtles and a horse. Both my parents are ‘gypsies’ and loved to travel and camp. Ditto my granny, who was prone to spiriting us gals away on road trips around the south, usually driving 90 behind a semi with all the windows open, and our bare feet hanging out the windows, stopping at every creek, rock shop and bbq joint we could find. My dad rode and raced dirt bikes when he was younger and we always had bikes around. My mom is a saint who spent most of her time trying to introduce us to a bar of soap, and out-fishing us all with a cane pole and a cricket. My parents moved us to Wyoming when I was 16, and although at the time I was sure I would die, eventually I discovered that I loved the mountains as much as I loved the swamp. I now live in Manitou Springs, Colorado, at the foot of Pikes Peak. Several summers ago I was dating a Fella who rode a BMW R1200GS and introduced me to Adventure riding world. I spent an entire summer on the back of a GS and I fell in Love (with the GS, NOT the Fella). Last year I sold my Vulcan 800 and became the proud owner of a BMW G 650 GS Thumper. Last summer a friend introduced me to RawHyde Adventures. They are an exceptional and amazing group of people, whose spirit for adventure and love of life I heartily endorse and enjoy. I jumped in with both feet and you’ll find me at the Colorado camp. I am a Licensed Massage Therapist, so when I’m not at Camp I’m doing massages, trying to grow vegetables on a red dirt hill, running or mountain biking, keeping the bears out of my compost bucket, going to as many music festivals as I can or making my way to one of Colorado fabulous craft breweries. I look forward to meeting you! Hello, I am Mike Rand. I was born in the heart of the Colorado Rockies in Leadville, only 10,200ft up in elevation. Currently I call home in Carbondale, Colorado. As owner of Hanging Lake Fine Art, I install, pack, crate, and manage works of fine art in the Aspen and Vail areas to museum standards. In addition, my personal ceramic, photographic and large scale installation works of art are exhibited internationally and museum archived. I am also father of two very energized daughters and a one son. I did not start riding motorcycles until my early 20’s. When arriving in Australia in 2000 to work on my master’s degree I quickly found myself on a R1150GS and did not look back. I started what most call the “adventure rider” lifestyle in Australia by riding literally straight across the remote desert roads of the Outback and mountains of Tasmania. From there I continued to ride all of the North American adventure roads from Prudhoe Bay to Goose Bay, parts of Europe, and everything in between. More of late, I ride my GS in Colorado and Utah normally surprising the other back country motorized adventurers as to where one can actually ride a 600lb motorcycle. Next to motorcycling, I enjoy back country skiing, and working with my kids in the family art studio. I started with Rawhyde Adventures when they opened their Colorado Facility outside of Hartsel. As a guide for Rawhyde to all the different Colorado back country roads, I now the get the pleasure of showing others all of the hidden riding and local treasures my state has to offer. After years of riding solo it’s great to be able to lead others in rides and adventures in the high altitudes of Colorado. Hi, my name is Ryan Russett. I was born in Waterloo, IA and moved to Phoenix, AZ in 1998 where I currently work a large utility as a journeyman lineman. I have been riding dirt bikes off and on for 25 years and was introduced to adventure bikes in 2012. I have a girlfriend and a son and we are huge supercross fans. My son has been riding since he was 5 and is now 11 and on his fourth dirt bike. My life is based around two wheels whether it be ADV riding, dirt biking, mountain biking, or watching supercross and motocross with the family. I was introduced to Rawhyde in 2013 when I took a next step class that my friend and fellow coach, Jason Houle, talked me into taking. I had so much fun riding and hanging out with the students and staff that I had to get involved. Eventually Jim let me join the team and I have had many great memories since. It is very rewarding to me to be a coach and teach people how to ride a big bike off road. There is nothing better than seeing confidence grow and forming lasting friendships with students and staff! My name is Trev Richter. I am from Ft. Collins, CO and have lived there since 1982. I own Colorado ADV Moto and have been a carpenter for most of my life. I have been on 2 wheels for most of my life, from BMX as a kid, and motorcycles from my teenage years until now. I have always wanted to combine my passions of camping, travel, and motorcycles, Adventure Riding has done that! It's amazing how many people approach you when on a bike. In my opinion, it's the only way to travel! Hello I am Wil Stillens and I am a Rawhyde instructor. I have been involved with Jim Hyde since I was 13 years old, what started out as pulling weeds, painting and demolition became the foundation for a very important friendship. Approximately, in 2002 I received a phone call from Jim—he asked me to come see something special that he wanted me to be a part of—and with that, my coaching career had begun. This was an easy transition since from childhood I had been riding dirtbikes, mountain bikes, anything on two wheels basically. I am an ex-downhill mountain bike racer on the California Amateur Cup, the State Series and Nationals. The skills are the same; weight shift, brake control, balance. I loved it and turns out I love teaching it as well. I love helping others with their motorcycle skills. Adventure riding the most rewarding thing I have ever done. I realize that adventure riding goes way beyond the bike... It is a lifestyle, with some of the nicest people I have ever met. I will do this for the rest of my life. So please ride with us and take the adventure of a lifetime! Hi friends, I’m Erin and I started riding later in life than many. Since 1999 I’ve been primarily a sport-touring rider, logging over 350,000 miles across the high deserts of California, Nevada, Utah and the Great Southwestern US. With a genetic pre-disposition towards “loving speed”, I began land speed motorcycle racing in 2004 on the Bonneville Salt Flats. With over 20 World and National Speed records under my belt, I came to RawHyde in 2016 to learn how to become more comfortable with motorcycles moving around under me on unstable terrain like dirt and salt. I’m extremely grateful for my fellow coaches who enabled me to quickly move from student to coach. I credit off-road riding for improving my land speed racing to where I am now a lifetime member of the Bonneville, El Mirage, and Mojave 200 Mile-Per-Hour Clubs with a top speed (so far) of 219.3 MPH. 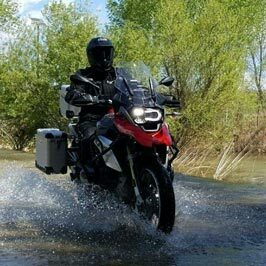 At 5’ 7” and 125 pounds, I want to demonstrate that smaller stature people – male or female - can confidently maneuver the 600 pound BMW GS 1200 in adventure conditions. I dedicate my coaching, riding and racing to my late husband, fellow land speed racer Andy Sills. Thank you, fellow motorcyclists, for continually reminding me that “it’s about the journey, not the destination.” I look forward to riding with you! Hi! My name is Adam Timm and I feel lucky to coach, and support tours here at RawHyde. My sense of adventure was cultivated as a child growing up and playing in the woods on the East coast. That led to a career as a professional wilderness guide, and instructor for backcountry emergency medicine classes. I found my way to Southern California at the end of 2013, and while I still do some wilderness instruction, these days, aside from working at RawHyde, I work as a motorcycle mechanic repairing, maintaining and customizing older bikes. As a longtime mtn biker and cyclist, I've always been fond of anything with two wheels, but didn't purchase my first moto until 2005. It wasn't long after that I was running it down the gravel roads. I took an Intro to Adventure class in early 2016, and a month later was working as a sweep rider for our Base Camp Alpha trips! I was honored to participate in the Expedition 65 trip as support driver/medic/mechanic, and began coaching at RawHyde in early 2017. I'm excited to see you out here in the dirt, and share my love of the outdoors, education, and motorcycles!!!!!!!! Hi, my name is Bob Haines. I grew up in Illinois, working on my Grandfathers farm. After high school I enlisted in the US Army serving in the Light Infantry. After an awesome career and numerous deployments overseas to some not so friendly places I retired in Colorado Springs, CO. When I’m not riding my BMW GSA on some mountain pass or getting roosted by my son on dirt bikes I serve my community as a firefighter for the CSFD. Like most of you I started as a student with Rawhyde in 2016, I came away from that incredible weekend with a longing to ride my motorcycle to the ends of the Earth. Early in 2017 I started as a coach with Rawhyde teaching the “Intro to Adventure” course as well as supporting some of the tours that Rawhyde offers. Rawhyde to me is so much more than just instruction and drills. It is a place where people connect and friendships are forged. A place where your story is appreciated and your successes and failures in training are celebrated. My other interests are chasing adventure as much as possible through mountain biking, climbing, (rock and ice) hiking and slowly ticking off the list of Colorado’s 14,000 ft peaks. I look forward to riding in the dirt with you. Hi, my name is J.J. Puglisi. I fell in love with and began riding motorcycles over 25 years ago. I have a law enforcement background, and one of the highlights of my career was riding a police motorcycle alongside the officers assigned to traffic enforcement. Completing motor school was a rewarding, yet humbling experience that further ignited my passion to develop my riding skills. Thanks to an understanding wife, and a co-worker and friend with similar interests, I was blessed with the opportunity to do just that, but on a big adventure bike, off-road. The best thing about this sport is the joy of sharing it and its challenges with others. I get great satisfaction not just in instructing, but in helping to add more members to the adventure riding family. That is what the RawHyde experience is truly about. See you on the trail! Hi there! My name is Sharif Massoud. 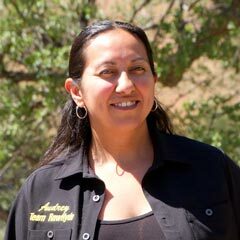 I'm native to California and have been riding motorcycles since the age of 10. I am truly honored to say that I have been a part of the ever-growing RawHyde family for almost a decade now. My primary duty is that of a paramedic both during training and tours. But over the course time, my responsibilities have extended to rider coach and tour guide. Many of my dearest friends, as well as significant travel experiences I owe to RawHyde. My favorite tours are the Big Bikes in Baja and The California Adventure. It humbles me to think of all the people that have been impacted by this place. And even after all this time, I feel like i'm just getting started. Hello fellow adventurers. My name is Steven Torgerson, and I’m one of the riding coaches with Team RawHyde. I was born in North Dakota, but grew up mostly in Colorado. I’ve been serving in the Marine Corps since 1998 with my primary job as an H-1 Pilot. Currently I am living in Southern California with my wife and three girls. My motorcycling background started out with sport bikes then moved into the dirt. Throughout my career I have spent lots of time as an instructor and after finding RawHyde I knew I wanted to be part of the team and share the passion of adventure riding with other people. I enjoy spending time outdoors, cooking, leathercraft, and anything to feed my wanderlust. See you out in the dirt! I was born in Newport News, Virginia and live in Los Angeles. I’ve been riding motorcycles since the early 80’s, and am also a veteran of the U.S. Coast Guard. I work for Fox Sports in Los Angeles as an engineer, and have been with the company since 1997. My first motorcycle was a Yamaha DT-100 Enduro. After that and up until 2012, all of my bikes were street bikes. I bought my first GS and became instantly hooked on riding these bikes off road. I attended all of the curriculum offered at RawHyde Adventures, as well as several tours and alumni rides. 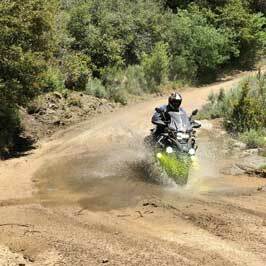 I have also ridden several Backcountry Discovery Routes as well as several rides in Mexico. I am now a coach at RawHyde Adventures, a job that I find very rewarding and a lot of fun!